Just a couple of comics today; picking up the rest at the weekend (which, FYI, I’ll be working a rare shift at the shop this Saturday, so swing on by!). 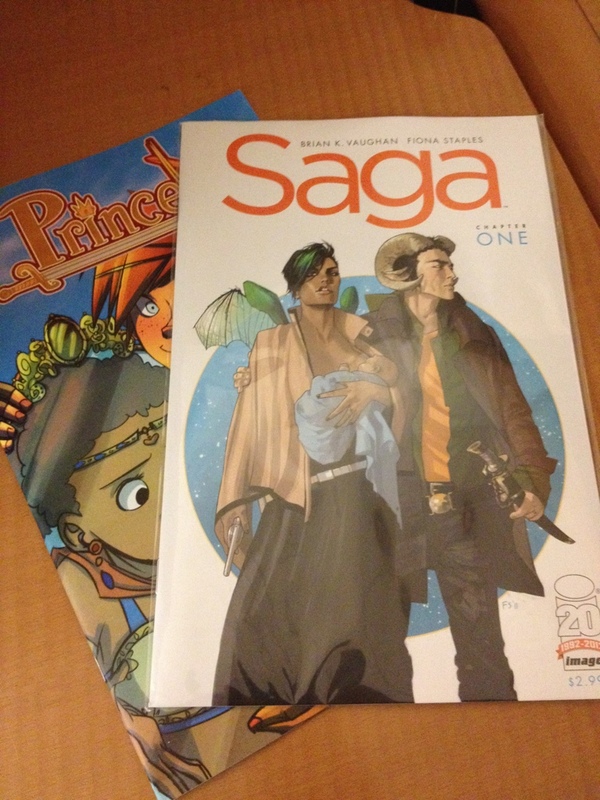 Excited for the debut of SAGA from Brian K. Vaughan and Fiona Staples at Image, and picked up a copy of Princeless I was missing. When I get sad about this industry, these are the things that remind me why I looooovvvvveee cccooommmiiiicccsss! This entry was posted on 03/14/2012 by ravenhaired. It was filed under Awesomeness, Comic books, Female Characters / Creators, What I'm Reading / Wednesday New Comics and was tagged with Action Lab Entertainment, Brian K. Vaughan, Fiona Staples, Firetower Studios, Image, Jeremy Whitley, Princeless, Saga.